I thought we might look at some of the many fine, steel bridges in Japan. 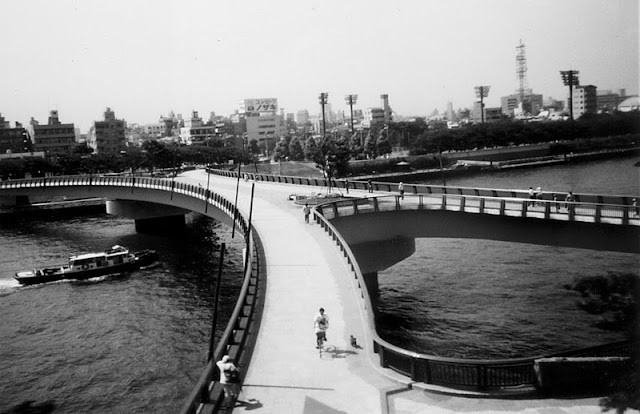 The Sakura-bashi (or Sakura Bridge) is a pedestrian bridge built across Tokyo's Sumidagawa (Sumida River) in 1985. The Sumidagawa runs for 27 km through Tokyo before emptying into Tokyo Bay. There are 26 bridges crossing the river, about one bridge per kilometer. I must have photographed the Sakura Bridge from the bus that we used to take into Tokyo from Tsukuba-shi (Tsukuba City), where we lived in 1994 (Tsukuba didn't get train service until quite recently). The Sakura Bridge has an unusual 'X' shape, and it also has posts mounted on the outside of the bridge (on the downstream side). Perhaps the posts support a barrier for the big fireworks festival during the last Saturday in July. I've noticed in more recent photos that a cone has been constructed where the arms (and legs) of the 'X' come together. The steel superstructure is supported on two single-column bents with hammer-head bent caps (and four ramped abutments). Tokyo's River Crossings: Sakura Bridge by Mark Yashinsky is licensed under a Creative Commons Attribution-NonCommercial-ShareAlike 3.0 United States License.